Part VI – Should You Invest Like Warren Buffett? While Part V focused on the trouble of trying to match the returns on the popular equity indexes, we must shift our focus to the only benchmark, or index, that if matched or outperformed will guarantee you have met your retirement goals. In a recent interview, New England Patriots quarterback Tom Brady stated that they start each year with one goal; “win the Super Bowl“. Unlike many other NFL teams, the Patriots do not settle for a better record than last year or improved statistics. Their single-minded goal is absolute and crystal clear to everyone on the team. It provides a framework and benchmark to help them coach, manage and play for success. Anything short of winning the Lombardi Trophy is a failure. When most individuals think about their investment goals, they have hopes of achieving Super Bowl like returns that guarantee a comfortable retirement. Interestingly, however, tracking an all equity benchmark like the S&P 500 index does not necessarily provide individuals with the road map to meet their goals. It is akin to the Patriot’s aiming to have a playoff worthy record. To explain this clearly, we need to have a better understanding of what we are talking about. Despite much of the mainstream commentary that if you simply “buy and hold” an index over a 118-year period you will be fabulously wealth, for the rest of us mere mortals, we only have the time from the start our saving and investing journey to where it ends. This is typically 25-35 years. Almost all investors benchmark their returns, manage their assets and ultimately measure their success based on the value of a stock, bond or a blended index(s). The most common investor benchmark is the S&P 500, a measure of the return of 500 large-cap domestic stocks. Additionally, there are long periods like we are currently witnessing where returns can be very flat, or negative, from the previous starting point as shown in the chart below. The table below is the most critical. The table shows the actual point gain and point loss for each period. As you will note, there are periods when the entire previous point gains have been either entirely, or almost entirely, destroyed. Even if we have a very long investment time horizon and are willing to ignore the high frequency of large variances between price and valuation, there is a much bigger problem to examine. Regardless of your answer, we bet that most people perform a similar analysis to answer it. Compound your current wealth by 10% annually to arrive at a future portfolio value and then determine if that is enough for the retirement need in mind. Simple enough, but this calculus fails to consider an issue of vital importance. What if inflation were to run at an 11% annual rate from today until your retirement date? Your portfolio value will have increased nicely by retirement, but your wealth in real terms, measured by your purchasing power, will be less than it is today. Now, suppose that instead of a constant 10% return, you were offered annual returns equal to the annual rate of inflation (the consumer price index or CPI) plus 3%. This past year, based on 2017 CPI of approximately 2%, the CPI plus 3% would provide a total return of approximately 5% (2% + 3%). That compares poorly to greater than 20% total return for the S&P 500. We venture to say that many readers would be reluctant to accept such an “unsexy” proposition. Whether a premium of 3% is the right number for you is up for debate, but what is not debatable is that a return based on inflation, regardless of the performance of popular indexes, is a much more effective determinant of future wealth and purchasing power. A quick side note– “Gambler’s Fallacy” as discussed in Part VII is a big physiological barrier facing most investors. There have been plenty of times in history where you literally could stick your money in a “savings” account and earn enough, “risk-free,” to “save” your way to retirement. The chart below shows the savings rate on short-term deposits adjusted for inflation. However, in recent decades, “savers’ have not been so fortunate. Furthermore, as noted above, most investors do NOT have 90, 100, or more years to invest. Given that most investors do not start seriously saving for retirement until the age of 35, or older, that leaves 25-35 years for them to reach their goals. If that stretch of time happens to include a 12-15 year period in which returns are flat, as history tells us is probable, then the odds of achieving their goals are massively diminished. Let’s set up an example to explain the impact of inflation more clearly. In 1988, Bob is 35-years old, earns $75,000 a year, saves 10% of his gross salary each year and wants to have the same income in retirement that he currently has today. In our forecast, we will assume the market returns 7% each year (same as promised by many financial advisors) and we will assume a 2.1% inflation rate (long-term median) to help determine his desired retirement income. Looking 30 years forward, as shown below, when Bob will be 65, his equivalent annual income requirement will increase to approximately $137,000 as shown below. Understanding the relevance of this simple graph is typically problem number one for investors. Many savers fail to realize that their income needs will rise significantly due to inflation. In Bob’s case, $137,000 is the future equivalent to his current $75,000 salary assuming a modest 2.1% rate of inflation. If the double-digit inflation rate of the 1970’s were to reappear, Bob’s income needs would be significantly higher, and a larger lump sum of savings would be required to generate that higher level of income. Even if inflation remains moderate slight increases in inflation will have a big effect on Bob’s equivalent income. A 3.0% rate of inflation, for instance, increases his annual need by $39,000. In this case, to meet his $137,000 retirement income goal and keep his wealth intact, Bob will need to amass a portfolio over $4.5 million. The figure is based on a 3% withdrawal rate matching the long-term Treasury yield. In this analysis, we give Bob a big advantage and assume that he has been a diligent saver and has accumulated a nest egg of $100,000 to jump-start his savings adventure. Furthermore, we start his investment period in 1988 following the 1987 crash. Bob’s first 12 years of investing was one of the greatest periods to be in U.S. equities. But did Bob reach his investment goals after doing EVERYTHING right according to the current mainstream investing commentary? Did just “buying, holding and dollar cost averaging” into the S&P 500 give Bob more than enough capital to meet his goals? Let’s take a look at 3-different investment portfolios. Portfolio 1 – “Buy & Hold:” – the “real” total return, dividend reinvested, S&P 500 index. Portfolio 3, – “Risk Managed” – the “real” total return S&P 500 index, but will switch to cash when the S&P 500 violates its 12-month moving average. Each portfolio will be “dollar cost averaged” at a rate of $650/month or $7500/annually. 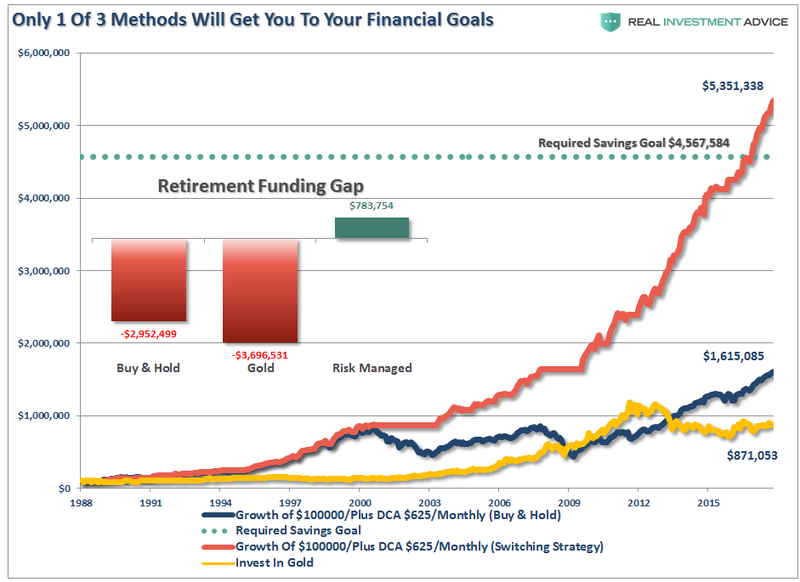 The reality of saving for your retirement should be clear as 2 of the 3 methods discussed above would have left Bob well short of his financial goals. “Risk Managed” has the best chance at succeeding. Unlike benchmarking to a popularly traded equity or bond index using ETFs and mutual funds, managing to an inflation-linked benchmark is more difficult. It requires an outcome-oriented approach that considers fundamental and technical analysis across a wide range of asset classes. At times, alternative strategies might be necessary or prudent. Further, and maybe most importantly, one must check one’s ego at the door, as returns can vary widely from those of one’s neighbors. The challenge of this approach explains why most individuals and investment professionals do not subscribe to it. It is far easier to succeed or fail with the crowd than to take an unconventional path that demands rigor. As we just discussed in part VII, herd bias, is a common psychological reason why most investors do not meet their financial goals. 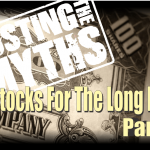 Most simply put and the recurring theme throughout this series – Buy and Hold Won’t Get You There.